Music Whenever: Tristen "Glass Jar"
1960's vibe. Simple guitar chords. Organ carrying the background. Great vocals. Music Whenever: Grand Analog "I Play My Kazoo"
I don't feature much rap (up to now, in all my music videos, there are no rap videos that I know of, )... I guess you could call this a lite-rap song by Grand Analog. My musical talent extends only to, but not beyond, the kazoo. So scour your living space for that special hideaway where your kazoo has been stashed... wait for about 3 minutes into this video... and join in - full bore... Playing the kazoo is good for your soul... Guaranteed. GRAND ANALOG - I Play My Kazoo from Southern Souls on Vimeo. The previous header photo was of Louis Pillon and his restored Monotype de Chatou. 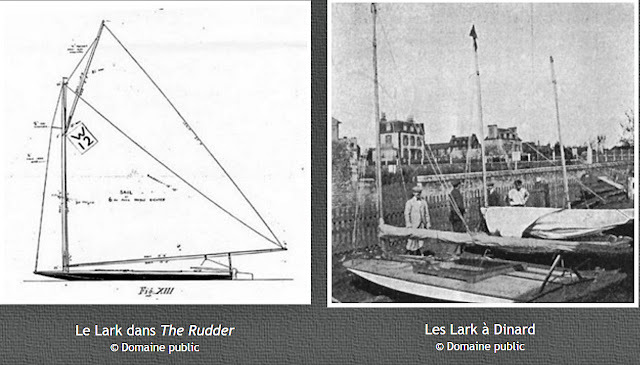 The Monotype de Chatou was a French follow-on to the American Lark scow, the Lark being originally introduced to France as the Monotype de Dinard. Designed in 1901 by Francois Texier, the Monotype de Chatou featured soft bilges rather than the boxy, chine shape of the Lark and the wide scow bow of the Lark was pinched in. The Monotype de Chatou was France's first popular dinghy with over 100 being built. 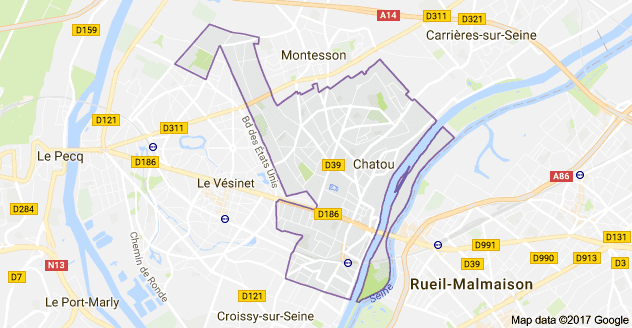 The drawing below is from the Wikipedia entry on the Monotype de Chatou. A photo of the three of the original French build of the American Lark scow, the Monotype de Dinard. Chatou was a western suburb of Paris, fronting the Seine River. There was a yacht club on the narrow island where the fleet of Monotype de Chatou's were moored. From Google Maps. In 1906, the French painter, Maurice de Vlamink, painted this scene (in the style of Van Gogh). 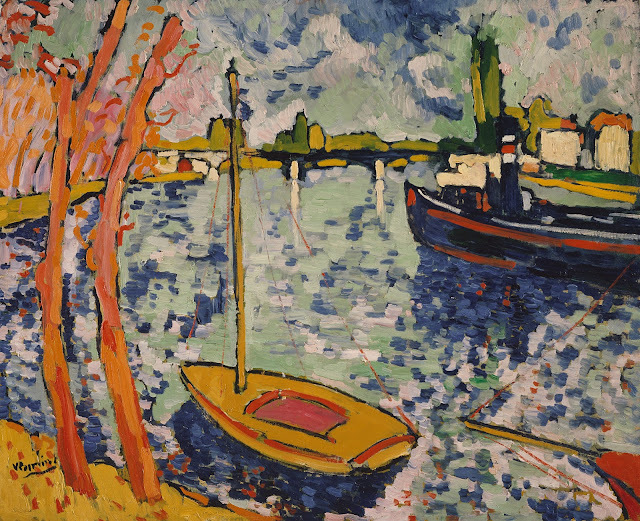 Painted from the vantage point of Île de Chatou, it is likely the moored sailboat was a stylized Monotype de Chatou. 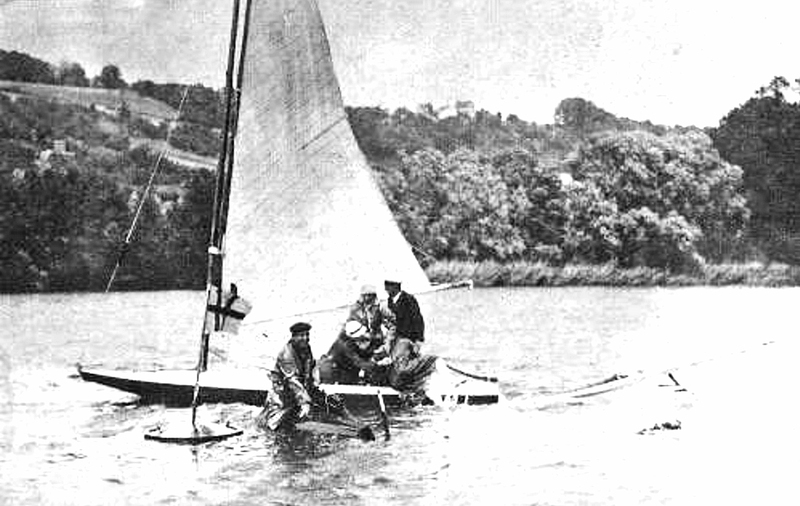 A rescue performed by a Monotype de Chatou. I'm not sure if the swamped vessel is another Monotype de Chatou. If this was a romantic Sunday sail, I would bet the lady being dragged over the gunwhale by the rescuers didn't bargain on being completely soaked by this mis-adventure.